This is a smooth rolling tyre which has been designed to withstand the rigoures of everyday street cycling like commuting & fitness riding. 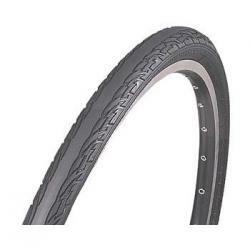 It has robust sidewalls and a rugged construction which gives long life & good puncture protection. It also has an even tread pattern and additional grooves to draw water away and deliver good grip and short braking distances in wet conditions. It comes in Imperial and Metric sizes.